In WYSIWYG mode or TeX. 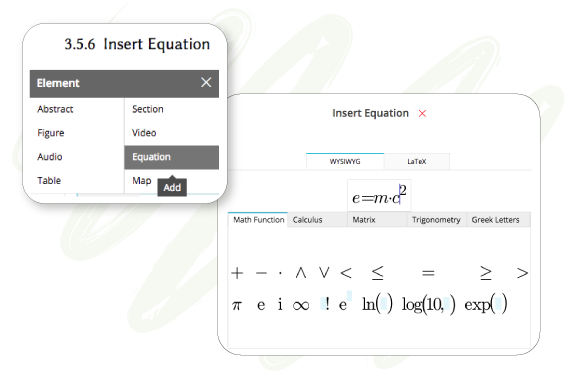 Ever thoughtful, AuthorCafe lets you enter equations of two different types: Inline Equation, or Paragraph Equation. Whatever the type, the equation can be entered in WYSIWYG mode or TeX. And regardless of input method, all equations can be edited as TeX. 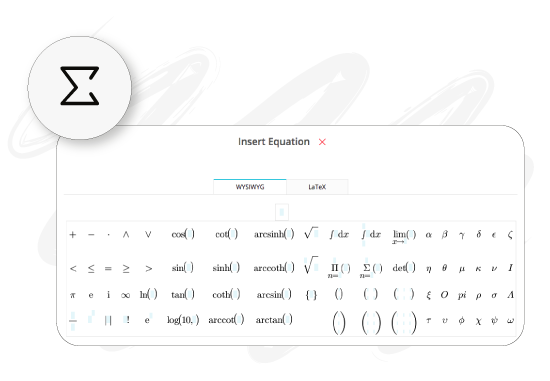 You can also import TeX equations and edit them as TeX, or simply write LaTeX. An Inline Equation runs on inside a paragraph. Such an equation is not numbered and is unavailable to cite. But it is very useful to send math content as a message that one can view even on a mobile device. To create an Inline Equation, click on the Sigma icon at top right and enter the notations from the palette, or use the backslash idiom. A Paragraph Equation that you insert is automatically numbered and is available to cite by its number. To insert one, choose Insert Equation from the Grey menu. In the window that launches, choose your comfort zone: WYSIWYG or LaTeX. The former type is editable as latter, but not vice versa. AuthorCafe has pending requests from user groups to accommodate grouped equations, which can be numbered and cited as 1. a, b, c. As we work on it, we keenly follow new developments that go beyond our implementation, which is based on mathdox for input and mathjax for rendering. Follow us for updates. Authoring in AuthorCafe is free.